A traditional Bulgarian Farmhouse, sympathetically renovated to accommodate a 1st floor, self-contained holiday apartment which offers a basic 'no-frills' accommodation in a typical Bulgarian Village. 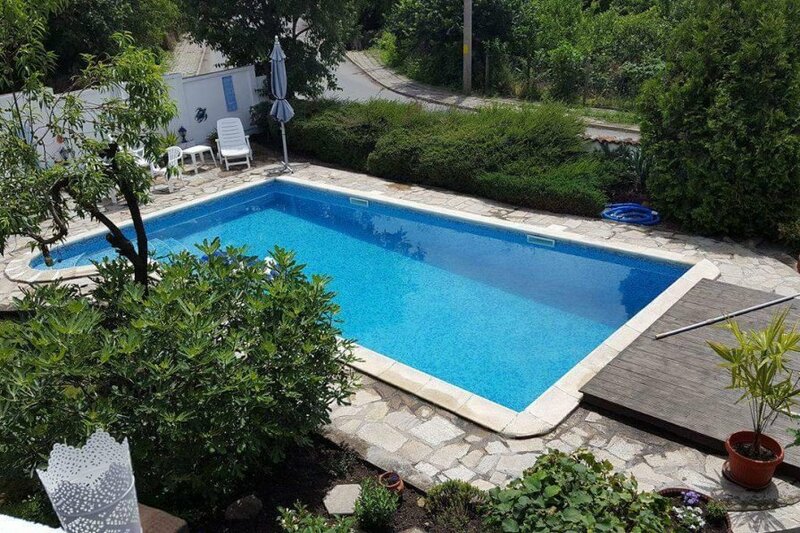 Villa Eden is a traditional Bulgarian Farmhouse which has been sympathetically renovated to accommodate a 1st floor, self-contained holiday apartment. The house has been restored to offer a basic, 'no frills' level of accommodation and as such unfortunately, has no internet or wi-fi connection and no TV! The property is set in mature gardens with fully fenced and walled perimeters, in a typical Bulgarian village location set amongst the Stara Planina Hills. Bryastovets is approximately half an hour's drive from both Bourgas airport and the busy tourist resort of Sunny Beach. If you are looking for a modern new-build and require a luxury accommodation with all mod-cons and within easy reach of vibrant night life entertainment, then Villa Eden is certainly not for you and you will be sorely disappointed however, if you like something a bit quirky and want to sample some ‘real’ Bulgaria or just want to get away from it all, chill out and relax, sunning yourself by your own private pool in a typical Bulgarian village, then this could be the ideal destination. The villa is set on a corner plot, on the main road through the village which makes for easy access and offers road-side parking right outside the property. A locked gate takes one into the mature gardens which surround the property and an exterior stone stair-case leads guests to the 1st floor, self-contained accommodation unfortunately, there is no wheel-chair access and the villa is not suited to younger children because of the open, exterior stone steps and the swimming pool which is very deep and not enclosed. The first-floor accommodation comprises of a double bedroom, a single bedroom, a fully tiled wet room and a combined kitchen/living area furnished with a bed-settee. A small balcony to the front of the accommodation affords views to the Black Sea on a clear day! We do not have air-con but fans are provided in all rooms. The living room benefits from a small kitchen area complete with kettle and toaster, microwave oven, 2 x ring hot-plate and a fridge/freezer. Pots, pans, crockery and cutlery are all provided as are bed linens, sheets and towels. Although we have no internet or TV we have installed a small viewing monitor and a selection of DVD’s. CDs, iPod docking stations and a choice of books and games are also provided including: darts, chess, badminton and even a few putt-putt holes! Villa Eden is surrounded by shrubs and plants and dependant on what time of year you visit you will find a variety of fruits, including: pear; plum; peach; fig and walnuts. There are several different seating options dotted around the property, with sun loungers, deck chairs and parasols on the pool terrace area, a bistro set under the shaded sail by the well, a wooden bench along the side of the house opposite the potting shed, (ideal for a chilled glass of wine at about 5pm!) and a breakfast table with bench seating under the balcony. There are also a couple of hammocks and a swing seat in the garden. The large entertainment area provides further seating with a dining area complete with fridge and a built-in BBQ grill for cooking on, there is also a traditional Bulgarian prep area which features a stone sink and running water. A second wet room is situated in the garden by the entertainments area and is ideal to use after the pool or when enjoying an al-fresco meal in the entertainment area. One can actually catch a glimpse of the Black Sea from the balcony on a clear day!